Our line of "Marine Family" shirts are unique designs created by the EGA Shop. The front of the shirts include the design shown below with your choice of family affiliation. The back of these shirts may be customized further with your choice of text for an additional fee. Most of the designs can be printed on additional products such as garden flags, car flags, ornaments, mouse pads, and cell phone covers as well. Click your favorite design and outfit your family! “America Calls Him/Her Marine, I call Him/Her ______” with digital desert camo text and a brown gradient EGA. Show your pride for your new Marine and let everyone know who your hero is! If your Marine is your hero, this is the shirt for you! My _____. My Hero. My Marine. You choose the affiliation that describes your Marine. Behind the text is a light grey line-drawn Eagle, Globe and Anchor. This design features text "The Few The Proud The ______" with an EGA and heart. Fill in the blank with family affiliation. Campaign ribbons: Desert Storm, Enduring Freedom, and Iraqi Freedom. Specific to the United States Marine Corps or non- branch specific applicable to any branch of the military. This design features the text "Proud Marine Family" where you can change "Family" to any family affiliation, such as "Dad", "Mom", "Wife", etc. The "O" in "Proud" is replaced with an Eagle, Globe, and Anchor. Featuring "The Few The Proud" and the Eagle, Globe, and Anchor in black and your choice of family affiliation. Proud Family design includes the Eagle, Globe and Anchor with a golden brown gradient text. You choose a family affiliation or just have “Proud Family” as the text. This grey design features the letters "USMC" separated by an Eagle, Globe, and Anchor with "Proud Family" below, where you replace "Family" with your affiliation. "1775" and an EGA are on the left sleeve. This design features the text "Proud Marine Family" where you can replace family with another family affiliation, such as Mother, Father, Brother, etc. The word "Proud" is made out of the United States flag with silhouettes of Marines walking in front. Design featuring "USMC" with the Eagle, Globe, and Anchor and "Proud Family" or your choice of affiliation below. Do you have a Marine protecting our country? Wear this design with pride today! It features the Iwo Jima in front of a waving American Flag. Proud ____ of a Marine on the front pocket and your choice of scripture on the back. 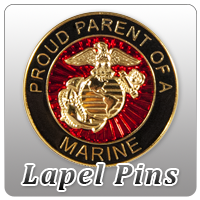 This classic design features the EGA Shop’s version of the United States Marine Corps Seal with text "Proud Family of a Marine" where you may change "Family" to a specific affiliation. EGA with stars and hearts in the style of a childrens’ drawing. This design features the text "Proud Family of a US Marine" where you can replace "Family" with another family affiliation, and replace "of a US Marine" with "or 2 US Marines" etc. Who Needs a Superhero when you have a Marine? You choose family affiliation. Rosie the Riveter (from World War II Recruiting Posters), with either "Proud Marine Mom" or "Proud Marine Wife", plus the Eagle, Globe and Anchor. This yellow design features the Eagle, Globe, and Anchor with "Marines" below and the text "The Few. The Proud. The Family." where you can replace "Family" with other affiliations. "My ___ Is A U.S. Marine" with your Marine's recruit depot, graduation date, company and PLT number. This design includes dog tags with an EGA you can put your recruit's last name on! A word collage with the phrase: To the World My ______ is a Marine, but to me, that Marine is My World. You fill in the blank with the family affiliation that describes your Marine.